The majority of the world’s irrigated area lies in Asia and more than 80% of water withdrawals are used for irrigation. For this reason, the need to improve the productivity of irrigation to ensure a sufficient supply of food, fibre and fuel for tomorrow’s population, is increasingly imperative. It is also instrumental for experiences from around the world across in policy, practice, technology, science and awareness to be shared. 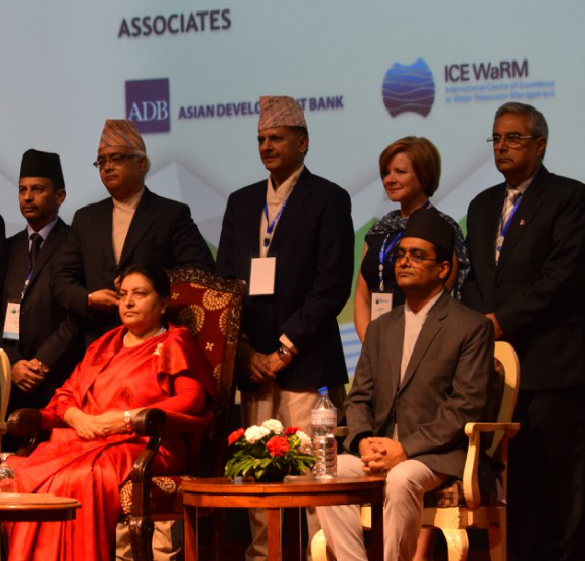 On 2-4 May, the International Commission on Irrigation and Drainage (ICID) 8th Asian Regional Conference, ‘Irrigation in Support of an Evergreen Revolution’ was held in Nepal and inaugurated by Hon President of Federal Democratic Republic of Nepal, Bidya Devi Bhandari. More than 700 participants attended the conference which included an interactive and engaging stream of symposiums and ICE WaRM was pleased to present on ‘Climate Change and Adaptation/Mitigation to Floods/Droughts’. Hon Karlene Maywald (Chair of ICE WaRM) and keynote Dr David Molden (Director General of ICIMOD) facilitated the session which included panellists, Dr K Yella Reddy, Mr Dipak Gyawali, Mr Daniel Casement (PIRSA) and Dr Luna Bharati. Issues on high altitude irrigation, climate change, carbon foot printing and valuing water, generated engaging and interactive discussion. The session recognised that an improved analysis of climate change was needed through ‘democratisation of data’ to aid the management of water resources, food security and improve livelihoods. Participants also expressed great interest in how valuing water could improve water use efficiency through micro irrigation techniques for improved crop production. “Food security depends upon not only the modernisation of water infrastructure but also modernisation of governance and institutional frameworks and modernisation of farming businesses”, said Ms Maywald. Ms Maywald also participated as a panellist in the Symposium on ‘Sustainable Irrigation’ which was jointly organised by IWMI and ICIMOD and facilitated by Dr Aditi Mukherji and Dr Luna Bharati. Since the main population in Asia still lives in rural areas, it is likely that rural transformation and development will be a powerful engine for sustainable development and improving the resilience of rural households to cope with emerging challenges into the future. During the inaugural ceremony a publication titled “Contribution of Agricultural Water to the Rural Development in Asia” was released by President Felix Reinders. The publication is a Technical Report of the Asian Regional Working Group (ASRWG).